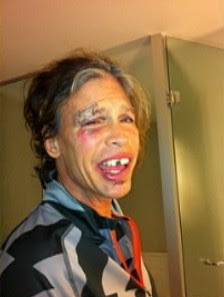 Now that the Paraguay shower incident has come and gone and the Aerosmith show is back on track, Steven Tyler is stepping up to explain what happened. Thursday morning, Tyler appeared on NBC’s Today Show via phone from Buenos Aires, Argentina, as the band plays La Plata on Friday. Host Matt Lauer than raised an issue that may be on the minds of fans: given Tyler’s history, was this a case of falling in the shower, or falling off the wagon? "Being in the program that I’m in, it's something we have to expect," Tyler responded. “I went public with my problems only to address them straight on, so people thinking that, is natural and normal. We flew last night from Paraguay after that incident and we're in Argentina for two hours. And anyone who knows anyone who uses substances wouldn't be up at this hour having a talk with Matt Lauer and the rest of America. It's nothing that I don't understand. I get that people think that; it still bothers me a little but it’s something I have to deal with the rest of my life." "So you're clean and sober? That's not the issue?" asked Lauer. "No, that’s not the issue," said Tyler. "Short of having my legs taken off, people are going to expect me on stage no matter what," joked Tyler. "I went out on stage last night and I wore my sunglasses for the first song. I took them off and the crowd roared. It's all about playing to the people. We rocked out. Not only did I break my face, but we broke a house record, so life is beautiful, Matt."